You travelled to Armenia and enjoyed the local coffee. Now you are wondering how to recreate and enjoy this drink back home? 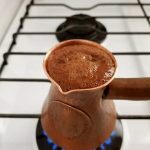 Well, we are going to teach you step by step how to make Armenian Coffee at home. 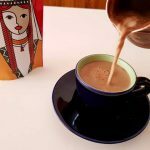 So what is Armenian Coffee anyway? A thick and delicious coffee enjoyed in this region which is certainly not for the faint-hearted. This small cup of coffee packs a punch! 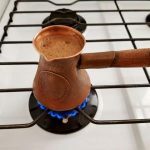 It gives you a caffeine boost that will keep you going for a while 🙂 This strong traditional coffee is how most Armenians kick-start their day. But first here’s a little background on the traditions of this coffee. We all know that food and drink brings people together. 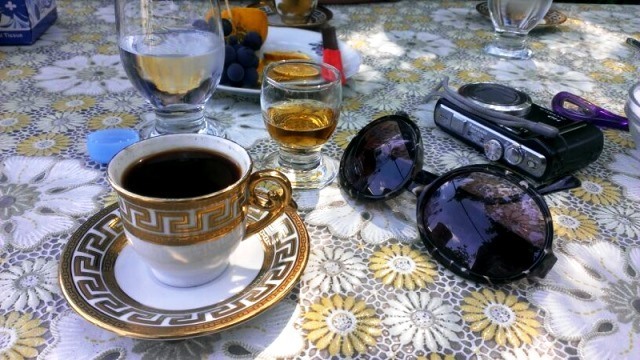 Similarly, this is not an exception for the Armenian coffee. It is very much a social drink, although you can enjoy it solo too, it certainly tastes better when shared. 🙂 It gives a reason for friends and family to gather around the table for a few minutes to enjoy this special drink together. Normally enjoyed in the mid-morning but there is no reason why it can not be enjoyed at other times of the day too. Regardless of time of day, it’s a cup best shared! How important is learning this art of brewing the perfect coffee? Well, in the ‘old days’, it was considered ‘time’ for a young person to marry once they could make this coffee with a nice head of crema on it. (This brings a deeper meaning to the phrase ‘for the love of coffee’)! So you can see how important coffee means to the local culture! Its probably worth noting that it gets harder to create the perfect crema when making multiple cups of coffee. So once you perfect making a couple of cups, test your skills on making 5 cups or more! Warning! For Coffee Lovers Only! 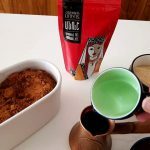 If you are not a coffee lover or don’t like strong coffee then this is certainly not the drink for you! This is a thick and strong coffee served in an espresso size cup. However if you love coffee then welcome to a new taste and texture sensation. It has a thick, almost grainy texture. For this reason, it is best to sip the coffee slowly. This allows the excess coffee to sink and sit at the base of the cup. You are not supposed to drink this sludge type sediment at the bottom of your cup (not even for the serious coffee lovers), it’s just too thick and dense to consume. So you are done with your cup once you reach this thick base. To make a good coffee, you need to have the right tools. The key to making this coffee is to own a ‘jazve’ coffee pot. We highly recommend you invest in one while you are in Armenia (many home ware shops sell these but also you can easily find them at the Vernissage Markets). A jazve makes for an impressive souvenir from your trip too (especially if you pick up an antique Soviet era jazve from the markets)! Imagine serving your coffee to friends back home in an authentic coffee pot! It’s guaranteed to be a conversation starter! 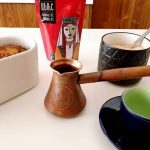 All the items you need to make the perfect cup of Armenian coffee. So you say you left Armenia without investing in a jazve? What to do now? Simple – plan your return visit 🙂 Setting jokes aside, the best alternative is to use a small stove top variety milk warmer. Otherwise, look up a Middle Eastern store in your neighbourhood. The joy of embracing multiculturalism in the world means it is most likely to be a store you can source an authentic jazve from close by! First of all, you will need the star ingredient: coffee! This fine ground coffee takes different names when buying it from overseas. 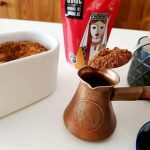 The coffee will appear as Armenian, Greek, Turkish or Lebanese coffee, as all these nations enjoy this form of coffee. Note that Lebanese coffee is often cardamom infused. 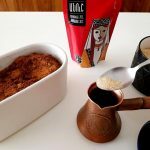 If so it will have a distinct flavour, different to the Armenian coffee, but still delicious and unique. Other ingredients are simple to find, just sugar (if using) and water. Now you are ready to start! Measure 1 (slightly heaped) teaspoon of coffee and place in the jazve. Add one teaspoon of coffee to the Jazve. If using sugar, measure desired amount and add to the jazve. Note that using one teaspoon of sugar will make a sweet coffee. Most locals drink with little or no sugar. So the amount of sugar is entirely up to your taste. 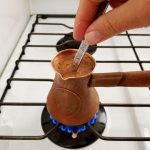 Using the espresso cup, measure one cup of cold tap water and add to the jazve. Add one cup of cold water to the Jazve. Place the jazve on the stove top on low heat. Stir to make sure all ingredients combine well and remove the spoon. (if you accidentally leave the spoon in the coffee, it may heat up and burn your hand. It also effects the formation of the crema, so it is best to remove it). Place the jazve on low heat on the stove. Stir to ensure all ingredients are well mixed. Wait! Seriously 🙂 This step is the linchpin of the art of making Armenian coffee! Not only does it teach patience but it also tests your skills of making the perfect brew. As the coffee warms up and brews, it starts to slowly rise (this is when the right sized jazve helps as you will see the coffee rise in the narrow opening of the jazve). Let the coffee rise but do not let it boil over. Removing the coffee from the heat at the perfect moment, makes the difference of excellent flavour and creates a nice thick crema on top. If the coffee boils over, the crema almost completely disappears and the flavour of the coffee is compromised. So watch over the coffee during this step to pick the perfect moment. Watch over the coffee as it brews. As the coffee brews it rises. Remove from heat before it boils over. Pour the coffee gently into the cup to ensure the crema gathers on top undisturbed. Call your friend or next door neighbour as its time to share your cup of coffee. 🙂 Best served with a delicious Armenian pastry’ gata. YUM!